Down to earth and highly motivated, Todd Glenz leads our team with skill and talent. Todd has more than two decades of experience in construction, having been a carpenter, superintendent, safety manager and vice president before becoming president and principal owner of McKenzie Commercial in 2007. His goal is to provide high-quality construction services to our clients and a great place to work for our employees. Often complimented for his management style and organizational skills, he has a knack for choosing the right person for the job. He knows the strengths of our staff members and encourages them to pursue their interests, which ultimately benefits every client who walks through our door. Never afraid to try new things, Todd seeks out unusual foods and new experiences. A married father of two, he’s always up for a board game and enjoys reading a good book. Approachable and responsive, Chad Blilie works hard to ensure that our clients are happy and that projects run smoothly. Chad joined our team as a project superintendent in 2006, quickly climbing the ranks to become one of our owners. Relationship-building is his greatest strength. Chad applies his relentless work ethic to every task, whether it’s hiring, on-the-job safety, estimating or managing a project. Knowing that satisfied customers breed new business, he delivers what clients want: a job well done, on time and within budget. When he’s not crunching numbers or overseeing projects, Chad is spending time with his wife and two children. To relax, he goes camping, fishing, hunting or mountain biking. An excellent time-manager with high expectations, Jim Mender goes the extra mile to ensure all partners are working together. A timber cruiser for years, Jim made a career change 27 years ago and never looked back. Prior to joining our team in 1999, Jim managed multiple construction projects, including buildings, sewer treatment plants, and bridges spanning minor waterways. Now one of our vice presidents, he has successfully overseen many public- and private-sector contracts. An expert problem solver, Jim is proficient in crafting budgets that hit the mark. In doing so, he finds ways to incorporate value engineering, while maintaining quality. Jim’s curiosity leads him down many paths. He enjoys reading, writing poetry and short stories, whitewater rafting and photography. 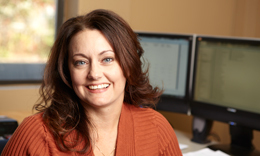 Organized and efficient, Heidi Aldous believes in prompt service and teamwork. She has more than 20 years experience in financial accounts management, specifically in construction- and trucking-related businesses. Heidi joined the team in 2005 as finance manager and, with her focus on team building and effective account management, began the move toward partnership six years later. Heidi ties together all the financial aspects of the business, applying her in-depth skills at organization to estimating and budget development. She revels in the details, working with the entire team to ensure both customer satisfaction and productive project completion. When not poring over spreadsheets, Heidi and her husband follow the busy soccer schedule of their daughter. She also enjoys reading and, for contrast, a good P90x workout.